I was never much of a breakfast eater. I mean, sure...I loved going out for breakfast on a lazy weekend morning, lingering over pancakes and coffee. But, I hardly ever ate breakfast at home...most of the time just a yogurt or bagel to eat in the car. You see, I'm not usually much of a morning person; I can't get motivated enough for a proper breakfast. However, over the past year I've come to appreciate a heartier breakfast...waking up earlier to cook up a few eggs, maybe some bacon, and actually sit down to eat. And now, I am a mess all day if I don't have breakfast. On Friday, before I went to work at the winery, I made a small pot of oatmeal inspired by a recipe I saw at Veggie Terrain. We'd had snow, sleet, and cold temperatures for a few days and I needed something warm and soothing to start the day. I'd never eaten steel-cut oats before, the kind that are supposed to be really good for you but take forever to cook, so I decided to use those for my breakfast. 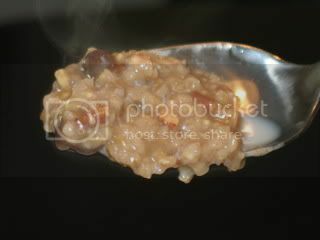 Stir 1/2 cup of steel-cut oats & 1/2 cup raisins into 2 1/2 cups of briskly boiling water. When it begins to thicken, reduce heat and simmer for 30 minutes, stirring occasionally. Add a bit more water, when needed, to retain creamy texture. When the oats are tender, remove from heat and stir in 1/2 teaspoon vanilla extract, 1 tablespoon brown sugar (or more to taste), dash of cinnamon, & 1/4 cup chopped walnuts. Put oatmeal in a bowl and top with milk. The steel-cut oats are a completely different texture than rolled oats. They are little nubbins of oats that, despite cooking for a half hour, retain a chewy "al-dente" kind of texture. The texture was a bit odd at first, but the flavor was great (just like an oatmeal cookie!) and I quickly finished off the entire pot! 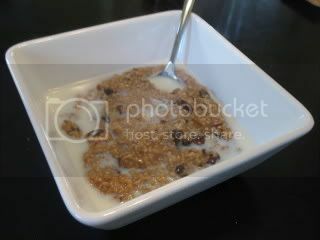 Anyway, I just wanted to thank you for linking to my Oatmeal Raisin Cookie Oatmeal post!